THE BELLA CASA .. Which means beautiful home. 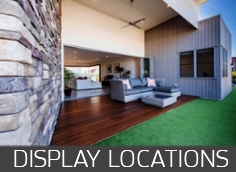 This Acreage Display casts an impressive street scope. This home lives upto its namesake of beautiful home. Complementary stone features, decked courtyards & stepped entry nod to the grandeur within. 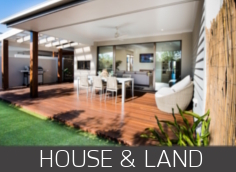 This home is styled beautifully to suit Queensland’s open plan easy living lifestyle. Large Office with Optimum space with its own separate external access and decked courtyard & can be hidden behind the beautifully stained timber cavity sliders. Step down into the living spaces which are boosted by the 3000 ceiling height, beautiful timber detailed in the coffered ceilings. Spectacular Entry feature with stone clad dual side gas fireplace can’t help but steal your eye, this not only offers beauty, but also has purpose in dividing the living and dining from the more intimate lounge setting. The Grand Alfresco spans the length of the living spaces again inviting the outdoors in with recessed stacker doors ingeniously designed with no corner posts allowing the magnificent view to remain unobstructed. The beautiful timber detailing to the ceiling of the Alfresco flows the space, with stained timber decking, ceiling fans, additional space with outdoor kitchen (with sink and rangehood) all surrounding the contemporary pool (with water feature). Master Chef Kitchen features stone tops – waterfall ends, under mount sink, fish scale splashback, pendant lighting, bulkhead, mixture of laminate and glass overhead cabinetry, two ovens, dishwasher, appliance nook where the kettle and toaster can be hidden away instantly, large butler’s pantry with additional sink, open shelving. Laundry features generous linen storage, subway tiling, additional island bench cabinetry to assist folding laundry. The Grand Master suite looks and feels as your own private getaway with two separate walk in robes, entrance niche, stunning laser screen room divider from bedroom to Ensuite. Spa retreat styled Ensuite with private Patio, freestanding Bath, dual vanities, dual shower heads, separate W.C and make up bench (including niches). All 5 Bedrooms have their own Courtyard. Breezeway joins Beds 2 & Bed 3. 2 Bathrooms, Powder room and Ensuite. Theater room with elevated platform, 3000 h ceilings, av cupboard, dual 820 doors for acoustic proofing.